Photo: Press conference dedicated to the launch of the “Equal Partners” gender strategy for legal aid with the participation of the Deputy Minister of Justice, Denis Chenyshov; Ambassador of Canada to Ukraine, Roman Waschuk; Government Commissioner for Gender Policy, Kateryna Levchenko; Head of CCLAP, Oleksii Boniuk; and QALA Ukraine Project Manager, Oksana Kikot’. Kyiv, November 27, 2018. The promotion and protection of human rights, equitable access to justice and inclusive public service delivery continue to be at the core of the Quality and Accessible Legal Aid in Ukraine (QALA) Project programming. 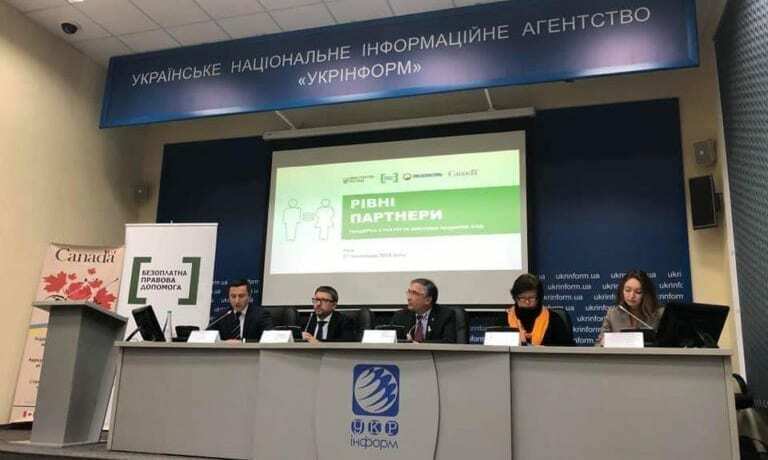 To this end, the project has provided advisory support and input to the Ukrainian project partner (Coordination Centre for Legal Aid Provision – CCLAP) in the development of the gender strategy for the Ukrainian legal aid system – “Equal Partners”. The strategy pays particular attention to the needs of women and vulnerable groups who may encounter complex forms of discrimination. It also seeks to address gender-based and domestic violence which continue to be pressing issues for legal aid practitioners and require a deep understanding of their gendered nature. Adopt monitoring and evaluation plans that support the gender mainstreaming agenda. Implementation of the gender strategy is anticipated to increase opportunities to introduce innovative approaches to legal aid provision for women and girls from vulnerable groups. It also aims to create openness and knowledge for legal aid system staff across all three levels (central, regional and local) to integrate gender equality into their work. To implement the gender equality strategy, the QALA Project is developing a distance learning course targeting multiple professional groups across the legal aid system. The course aims to incorporate gender-mainstreaming into all areas of the legal aid system’s operations. It is expected to launch in mid-2019. The Quality and Accessible Legal Aid in Ukraine (QALA) Project is a technical assistance initiative funded by Global Affairs Canada. It is implemented by the Canadian Bureau for International Education (CBIE) in cooperation with the Coordination Center for Legal Aid Provision (CCLAP) under the Ministry of Justice of Ukraine.